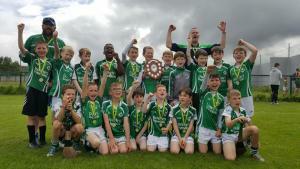 Under brilliant cobalt skies in Blackrock Ballincollig u10 hurlers went on to a pitch and beat Eire Og to win the Cashman Shield in the time it takes a hungry man to eat his dinner. It was particularly sweet as Eire Og had previously knocked out our other team earlier on. The pitch was crowded with outstanding players: Finn O’Sullivan, Dan Hogan and Jack Ryan were rocks at the back; Tadgh Hayes and Colm Keneally served time in goal to good effect. Darragh Crowley took more hits than the Bismarck and in a passage of play when we were under huge pressure twisted and turned to send over a point from the far right hand side to lift the team. Habeeb in the front line was as subtle as the Blitz, ably assisted by Kevin Coffey, Jack McCarthy, Adam Hennessy and Daithi Murphy. And in midfield Brian Cronin was irrepressible, leaving his marker continuously looking like a fire engine going to the wrong fire. It may have been the Shield final rather than the Cashman Cup proper, but that mattered little to the players. The Glen – worthy winners of the Cashman Cup - have set the standard at this level: we know what heights we need to reach to match them. The great American humourist Garrison Keillor once wrote that some luck lies in not getting what you wanted but getting what you have, which once you have it is what you would have wanted all along, had you but known. We have tasted success at one level, and out of that have learned what is needed to make the leap to reach the standard set by the Glen. It’s often said that in hurling, you are either winning, or learning. On Saturday we managed both. Prior to this Cashman Cup/Shield Finals day, we visited our neighbours Eire Og in Ovens. 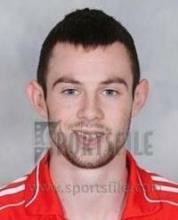 If Eire Og didn’t exist we’d have to invent them. Every sporting organisation neds a rival, less Holmes and Moriarity, more Springfield and Shelbyville. We have more in common than divides us, of course, working alongside each other, frequenting same events, speaking similar forms of English. But it’s a rivalry nonetheless, and matches between us tend to be combative. Confusion surrounded the conclusion of the first match, with each side feeling they had won by one score. With the wisdom of Solomon, the referee marked a draw. This was followed by a couple of narrow defeats, with one outstanding player from Eire Og in reality the difference. Best for Ballincollig were Luke O’Mahony, Oisin Ryan, Finn Murphy, Kevin Walsh, and Tadgh Hayes. Thanks as always to our referees who officiated all matches on Saturday, Finally, credit to the impossibly handsome traffic wardens who did a great job. Best traffic management of the Cashman Cup so far, and you can’t really put a price on that.